About the Children's Department: Remember This One Essential Truth - Choose Wisely! Remember This One Essential Truth - Choose Wisely! I've been writing about what I consider to be essential truths for us to remember as we serve in children's ministry; God Cares the Most and Love Matters. Today I want to write about one more; Choose Well. Do you remember the movie, Indiana Jones and the Last Crusade? In this movie they are searching for the Holy Grail. When they find it, they discover not just one cup, but many. They have to choose which one is the Holy Grail; but if they choose "poorly", they will not receive "everlasting life", but will instead age immediately and die . . . big price to pay for "choosing poorly". 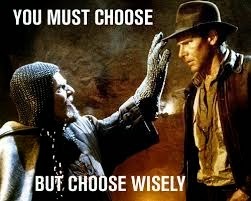 Of course, the bad guy, "chooses poorly" and dies and Indiana, "chooses wisely" and selects the correct cup. Just a movie, but in real life we have many choices each day where we have to be on guard so we, "choose wisely" because, "choosing poorly" does have a big price to pay. Consider the following . . . When the choices of others hurt us - and sooner or later other's choices will hurt - if we respond in kind, we are, "choosing poorly" and will ultimately pay a big price. If however; we respond as Jesus did, we are, "choosing wisely"! When we are gossipped about - and sooner or later this is likely to happen - if we gossip in return, we are, "choosing poorly" and will ultimately pay a big price. If however; we respond as Jesus did, we are, "choosing wisely"! When we are taken advantage of and treated in a way which does not show appreciation - and sooner or later you are likely to be taken advantage of and treated in a way which does not show appreciation - if we respond in kind, we are, "choosing poorly" and will ultimately pay a big price. If however; we respond as Jesus did, we are, "choosing wisely"! It is all too easy to, "respond in kind" when we are treated badly, but doing so is "choosing poorly" and does carry with it a big "price tag". Making the more difficult choice and choosing to respond as Jesus did no matter what the situation, is definitely, "choosing wisely" . . . commit to, "choose wisely"!